I followed her directions for the turn off to Kelly Street, a long and slow road dotted with mobile homes. I turned left at the fork as instructed, and started up a single lane gravel road with neither signage nor signs of life. I drive extra slow on these types of roads. I encountered a few up in Oregon north of Crater Lake. They’re always long, always rough, and they never give any indication of how long you’ve been driving or how long you’ve left to go. They make me nervous. I started to wonder if anyone else ever went to see the Kelly Ghost Town. That’s when the Check Coolant light went on. 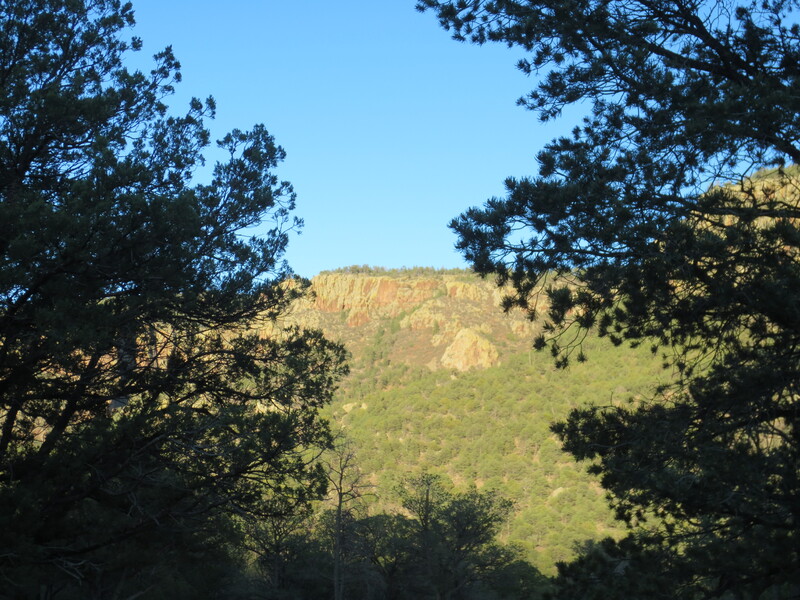 For those who have never been, New Mexico is a land without shade. Trees are few and far between. Clouds, when present, are mostly decorative. Which means despite my desires and better judgement, I had to stop and check my engine in the middle of the 95 degree sun. Looking at the coolant tank, I confirmed it was at the top of the minimum amount line. My car likes to warn me of things in plenty of time, so there was still a fair amount left. I also knew that in a pinch a person could use water as coolant, and I had just refilled all my water stores at the VLA. I looked up and down the road, wondering if it was worth the risk. I had no idea how far the ghost town was. If it was only a little farther, it might be better to go there, let the engine cool a bit while I explored, and then head back into town. Or it could be a considerable distance, my coolant tank could be leaking fast, and I could find myself walking back to town alone on the road where heat was invented. I remembered how uninterested the woman in town was when I mentioned Kelly, and decided to turn back. Before I left for this trip I had my car checked, and I mentioned that I suspected I might have a small coolant leak. They confirmed I was correct, and fixed it for a pretty penny. I wasn’t sure if this meant there was still a leak, or if driving in the desert sun for three days was just a bit much for my little Jetta. I called my dad to discuss possible courses of action, and he agreed that for now I should just fill up the tank and keep an eye on it. If I noticed it slipping away more I could take it in for service. In town I found an auto repair shop and picked up some coolant. The woman behind the counter confirmed that Water Canyon, the suggested camping destination, was a lovely place. I filled up the coolant tank in the parking lot and ended up spilling some on myself. I went back in to ask if they had anywhere I could wash my hands, and she looked at me hesitantly. “The best I can offer you is some wipes. Our town is out of water.” Apparently water is being trucked into Magdalena and rationed, and as a result the restroom was closed. Such are the problems you don’t realize some people have. I drove out to the turnoff for Water Canyon, noting the distance listed to the campground so at least I would know how far I’d gone if the paved road turned to gravel. I drove for awhile, past a couple houses nestled together, and reached the campground sign. It gave an arrow pointing off towards, as expected, a long gravel road. I’d already reached the distance listed on the highway sign, which meant I was back to guessing. I drove up slowly, eventually making it the the campsites. There was a board labeled “Information Center” that had some nice signs about littering and rabies, but no information about payment. I circled the campground to be sure. This place was free. It was also empty. There was no drinking water – not even the sound of a distant stream. I was two miles from the houses, six miles from the road, and 16 miles from a town with no water. I was completely alone in the desert. I picked out the shadiest looking site, which happened to be right next to the entrance. I suppose I also wanted to know if anyone happened to join me. Solitude and reflection is one thing, but sitting at the picnic table swatting away flies I suddenly felt so isolated and vulnerable. It’s the same feeling I get on those gravel roads. The creeping realization that if something goes wrong, it will be fully up to me to determine and execute a solution. There is no one to help. And here I am, protected only by the faith that this big metal box I’m driving will keep functioning as usual, because if anything goes wrong I have neither the skills nor the tools to fix it. I know that I am capable. I know that I am prepared. But part of being prepared for the worst is a deep fear and certainty that the worst will occur. That’s the kind of fear that sneaks up on you when you find yourself completely alone in the truly inaccurately named Water Canyon. That subtle panic that reminds you that characters in horror movies never suspect they’re in a horror movie until it’s too late. That useless knowledge that you could have a brain aneurysm at any moment, fall to the ground dead, and be slowly devoured by turkey vultures. And so you get out your computer and start to write about how you feel. And you start to think about how nice it is to have a gentle breeze and a free place to stay for the night. About how the canyon really is lovely and the flies are dying down. About how you just climbed nine miles out of the Grand Canyon with the exact same supplies you have in your car, and a two or five mile walk to find help wouldn’t kill you if push came to shove. Feeling a bit better about the situation, you get out a slice of bread and some Nutella. And just when you consider going over to the information bulletin board to learn about rabies, two Forest Service fire prevention trucks drive through the campground on patrol, and the six able-bodied men inside give you a nod. Even in Water Canyon, you are not alone. This entry was posted in Commentary, Nature and tagged Magdalena, Solo Traveling, solo-camping, Water Canyon. Bookmark the permalink.